If there ever was a perfect time to wear metallics, sequins, glitter, or anything sparkly for that matter, this time of year is the perfect time to do so. I mean what screams out festive more than a banging shimmery outfit, right? Metallics have been super trendy this fall but I know it can be a little intimidating for some to wear because it does attract some attention. BUT during the holiday season, wearing a silver ensemble and standing out is totally acceptable and more or less the norm. Any outfit that sparkly, shimmery, or velvety, would be a great look for a holiday party, especially NYE festivities. I styled this pleated silver two piece with with these darling Sam Edelman heels. I was at Nordstrom looking for some strappy sandals, something like the Stuart Weitzman Nudistsong sandal without breaking the bank, but didn't find any. I ran into these SE Addison heels and thought that they were cute, once I tried them on I was in love and thought that they would pair perfectly with this outfit. 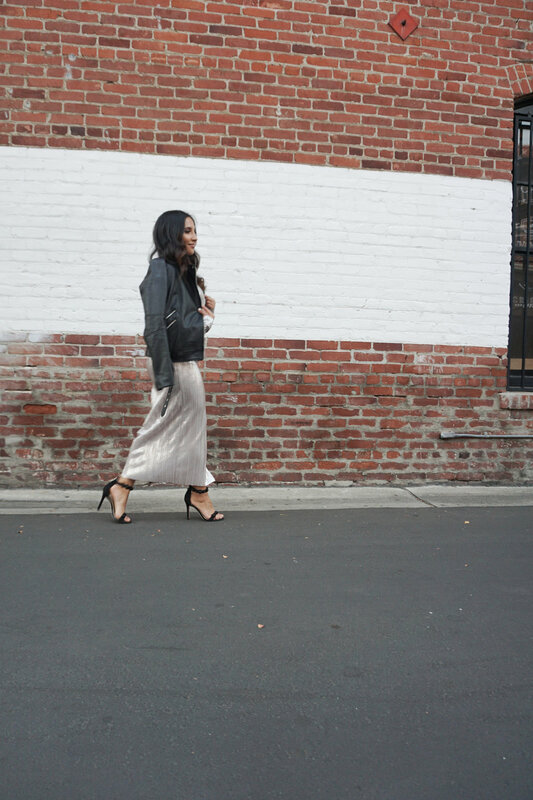 I decided to drape over a leather jacket to add some edge and cool girl vibes to this ladylike outfit. If going for a full on metallic look is not for you, make the top of bottom be the stand out piece, that's equally as festive. For a second I thought of styling my skirt with an oversized sweater for more of a cozy feel but for the sake of the pictures I decided to go all out, silver on silver baby! I linked some outfits that are very holiday appropriate down below that would be great options for upcoming NYE parties and Christmas parties. Hope they serve as inspiration at the very least!